The disaster was the first big emergency faced by Bolsonaro and his government since he took office in early January, and may be one of the deadliest disasters in Brazil’s history. The dam, used to store byproducts of an iron ore mining operation owned by Vale SA, burst on Friday. Located in southeastern Brazil, the region has a thriving mining industry.Vale is Brazil’s largest mining company. In 2015, a dam administered by the same company collapsed and killed 19 people only 75 miles away from the site of the current tragedy. 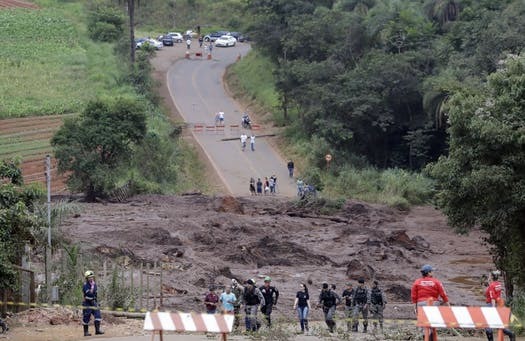 Rescue operations were briefly halted Sunday with officials fearing another breach in the dam in the city of Brumadinho. Residents were told to get ready to evacuate before the dam was found to be secure. The dam collapsed Friday, sending water and mud over hundreds of mine workers enjoying a lunch break.Rescuers say about 250 miners are missing and feared dead. Firefighters said they immediately began evacuating communities near the dam.Dozens of helicopters were set to be deployed because the thick mud was treacherous for ground rescuers to venture into. Late Sunday, more than 100 Israeli soldiers and other personnel arrived with plans to join rescue and recovery efforts Monday.Rescue operations saved over 200 people but authorities believe almost 300 more are still missing. Brazilian President Jair Bolsonaro flew over the devastated zone on Saturday, later tweeting that it is “difficult to not be emotional before this scene”.